Description: Loose Bohemian style rose cut red garnet for replacement in antique jewelry to keep the 'authentic' look or to have set in your made to order antique designed jewelry. 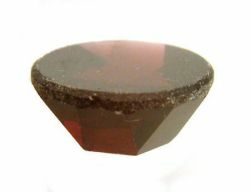 Rose cut garnet gemstone cabochons have a faceted top and flat back. They are offered in a variety of popular sizes from 1.0mm to 8.0mm in round cut or 6x8mm to 8x12mm oval cut. 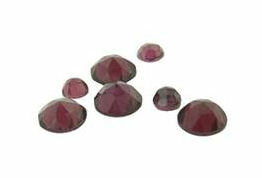 These are hand cut almandite garnets that have a nice red color. Because they are hand cut there is a tolerance range. Each size will have a tolerance of -.25mm, ex. 2.0mm stones will range in size from 1.75 up to 2.0mm. Very rarely are these stones over sized, so count on them running slightly smaller as they are uncalibrated and cut by hand. 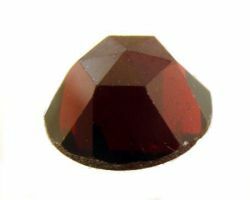 Usually jewelers need to scavenge around for broken antique jewelry to pick the antique rose cut garnets out as the only way to find replacement stones but not anymore. Sold individually. We can set into one of our settings for a small fee of $15 to $35, depending on the stone size and degree of difficulty to set. These are considered cabochons however and work better in mountings specifically designed for cabochons. Shipping time: In stock sizes ship in approx. 1 to 3 days.